In the digitally driven world of sales, complacency and stagnation are easier than ever to overcome. For almost any business, growth is essential—revenue growth, sales volume growth or growth in profitability. If you aren’t growing or if you aren’t doing better than last year, you should be trying like crazy to find out why. “The first days are the hardest days, don’t you worry anymore. Selling things confidently requires a certain amount of comfort. Indeed, when sales reps become extremely proficient at selling a particular type of product, part of the reason why they are successful is that they are extremely comfortable with all aspects of the product itself and how it solves problems. The message, the value proposition, the audience and other elements are all second nature to the successful sales rep, and the entire transaction becomes very comfortable for them. And, therein, lays the problem—comfort quickly gives way to complacency. Even worse than complacency is risk aversion and the avoidance of more difficult selling challenges. In other words, comfort is the portal to being in a rut and selling only what requires the least amount of effort. When this happens, opportunities are lost, growth begins to slow and all of the arrows on your results charts start pointing in the wrong direction. CPQ and other applications have the capability to guide the sales rep through the unknowns that are common to a new product, market or new customer. The buying cycle needs to be driven by a guided selling process; a process that accumulates knowledge and facts and uses them to move the conversation forward. Guided selling, empowered by CPQ, delivers the same benefits to Sales as it does to customers. CPQ asks the questions, and the answers provided guide the path of the sale toward one solution versus another. 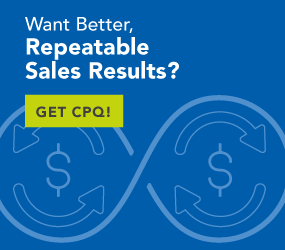 The CPQ-driven sale starts with an interactive, scripted interviewing process. A set of questions are asked, and the supplied responses drive the next set of questions. This response process is based upon inputs received from expert sources such as Engineering, Product Management, Legal or Marketing. All of this expert input is built into the business rules associated with the product and the parts, assemblies and options making up the product family. Things like environmental limits, usage restrictions and prerequisite or corequisite requirements are all tied to the business rules that drive the responses and questions supplied by CPQ. This ability means that a sales rep can confidently engage with a customer without having a deep knowledge base about the product sold or market involved. If they can read the script or questions and select the answers supplied by the prospect, they can move forward with creating a configuration, providing a firm quote and if necessary, producing a full-blown proposal. The heavy lifting is accomplished by the AI-empowered business rules engine within CPQ. Esoteric market terminology and specific requirements that are peculiar to a given market are all understood by CPQ. The sales rep can engage with the customer, and CPQ will guide their conversation. The rep will, of course, pick up much of this terminology and knowledge in the course of using the product and by interviewing multiple prospects. The more repetitions, the quicker the rep will gain the familiar feeling of confidence. Good sales reps love to sell. Removing obstacles from their paths is always good. CPQ removes the obstacles of knowledge and product minutia from the path of reps seeking to sell new products, new markets or a combination of both. CPQ makes it comfortable for sales.